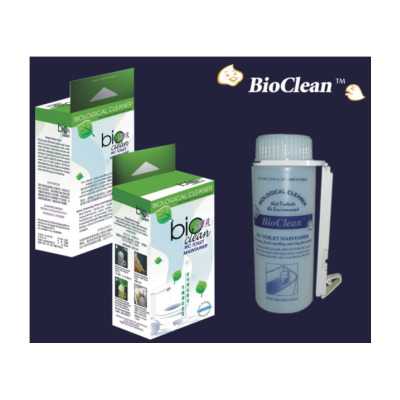 With an environmentally safe ‘BIO-ENZYMATIC’ action, BioCleanTM WC Toilet Maintainer automatically cleans the toilet with every flush. 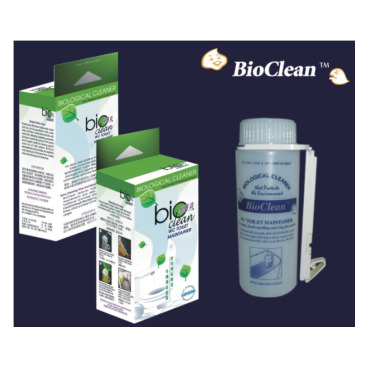 It is placed inside the water closet and with each flush, releases a powerful biological cleaning formula that breaks down organic waste from the toilet system. DOSAGE: BioCleanTM is good for 3,150 flushes, which is at least 2 to 3 months for most usages. DIRECTIONS: Place inside water closet and immerse bottle within 1 to 2 cm below water level. Refill when empty. REFILLABLE: Dilute one 50ml BioCleanTM CONCENTRATE Sachet to 200ml with water in recycled BioCleanTM bottle. DIRECTIONS - Place inside water closet and immerse bottle within 1 to 2 cm below water level. Refill when empty. DOSAGE - BioCleanTM is good for 3,150 flushes, which is at least 2 to 3 months for most usages. REFILLABLE - Dilute one 50ml BioCleanTM CONCENTRATE Sachet to 200ml with water in recycled BioCleanTM bottle.